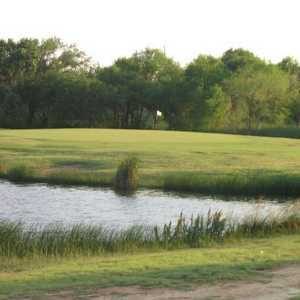 LUBBOCK, Texas - Nestled in Mackenzie State Park is Meadowbrook Golf Complex, home to the Canyon and Creek golf courses that, as their names indicate, offer totally different tests of golf. The tall trees throughout the 36-hole complex give Meadowbrook an aged feeling and look, which is part of the reason it boasts many loyal customers. Brothers Tim and Jim Wilson have been playing Meadowbrook for decades. "We've been playing this course for over 40 years," Tim said. "It's just the old, established course. It's old trees, tall trees. It's been here forever." Having loyal customers like the Wilsons is what Head Professional Anthony Below likes, too. Many have complimented him, saying they have never seen the course in such good shape, which was not the case three years ago. With improvements to the grass and greens, Canyon plays even tougher with its biggest challenge coming immediately. The par-5, No. 1 is a monstrous 593 yards so forget about getting home in two. And don't go right -- the trees follow the hole to 100 yards from the green. Below said, given its setting in Yellowhouse Canyon, Meadowbrook is nothing like anything else in the area. And though beautiful to look at, the natural rolling hills and the water hazards can spell trouble. "For the most part if you look in Lubbock you can see it's a flat city. Most of the courses in town are set up that way," he said. "One of the benefits we have here is we have some contour, we have a bunch of trees, and we have some water hazards, as well. That's what sets us apart." Those pesky trees come into play again on the short par-5 eighth. It seems easy to score well here when you consider the yardage of 477 yards but a large tree hanging over the right side of the fairway makes an approach from that side of the fairway difficult. Water guards the tiered green about 20 yards in front. Canyon is the more forgiving of Meadowbrook's two courses but don't make a habit of missing the fairways. Tall elm trees protect the course from sacrificing too many low scores. The complete opposite of Canyon, the Creek Course is exactly what it sounds like. Water is in play on half the holes. "Obviously more people are going to enjoy the Canyon Course because it's more wide open," Below said. 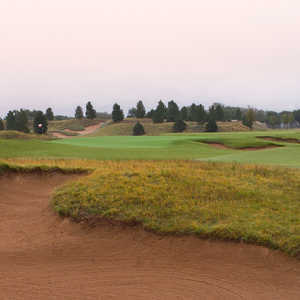 "You can miss a fairway and still have an open shot to the green, whereas on the Creek Course, water hazards and tree-lined fairways are going to pose a problem for some golfers." The testy, par-3 sixth represents the hardest hole on the Creek. With water all down the right side and an elevated green sloping toward the water, hitting a long iron into the 235-yard hole will challenge your nerves and accuracy. "When you look at the hole and you see water along the right side of it and there's not a lot of room between the green and the water, it's gotta intimidate anybody, especially if you're playing from the back tees," Below said. More water and tight fairways await you after escaping the sixth. On the Creek, hazards need to be carried on the drive and are just far enough out to make you nervous on the tee. But straight drives on the short grass make the par-70 course attackable. If you sacrifice too many strokes on the front nine, you're in luck. Perhaps the easiest stretch of holes in the city, 10-13 is your chance to put low numbers on your scorecard and take advantage of four holes with no trouble. An opening par-3 with a flat green, No. 10 is a par waiting to happen. Nos. 11 and 12 are back-to-back par-5s with plenty room for error. 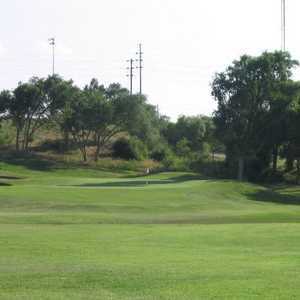 Huge fairways welcome big swings and both holes are reachable in two at 475 and 485 yards. The par-3 No. 13 poses no serious threat at 193 yards from the tips and plays downhill. Take advantage of that stretch, however, because you will meet an approach over water to a green surrounded by water on 14. Below said surviving 14 is a must if you want to actually put your recent low scores to use. "If your front nine on Creek just went bad, you can make up a couple of strokes right away one the back nine," he said. "If you have a great time on 10 through 13, you have to make sure you don't hurt yourself on 14." The knock for Creek is you are nowhere near the clubhouse except on the first tee, but the beverage cart makes frequent appearances. If you don't mind a little noise on one hole, No. 5 tee is next to the amusement park. Meadowbrook boasts two courses with two different flares for the game. Play them both to test your ability to recover on Creek and to take advantage of the freedom to smack your driver 14 times on Canyon. The green fees are a positive, as well, as they run from $21-$35 with even better twilight rates to make late-afternoon golf very affordable. The practice range has decent balls and good grass. It is bit of a hike from both first tees, however. The putting green is huge, giving you plenty of room not to compete for space before you play. The clubhouse bar is not large but has comfortable seats and Texas Tech sports heroes are painted on the walls. A large patio overlooks the ninth and fourth greens. Right next to Wal-Mart, in case you forget your toothbrush, is what is known to some Lubbockites as "Restaurant Row." With four restaurants and three hotels it makes a great place to stay in the center of Lubbock. Lubbock is the nation's capital for restaurants per capita, so finding a place to eat will not be hard. Being in the South, perhaps barbecue is what you will crave. County Line, Cagle Steaks and 50 Yard Line will more than satisfy. If you're looking for a little history, hit the Depot District where local musicians play and you can visit the Buddy Holly Museum. Next door to the museum is Hub City Brewery, an award-winning brew pub (they have the medals to prove it). The brick oven pizzas are a popular choice. What person in India was in charge of this.